I have attempted to make a complex cast using a mould of paper and two different kinds of sand/stone/gravel inside and outside of the mould. I laser cut the mould itself to attempt to replicate a shape previously generated in a computer. The first thing I did was to do a series of experiments to see what recipe I should follow. From this I gattered that I should keep the part of water over 0.8:1 maybe even 1:1 if it’s a deep cast. I used a part of our group project as the design for my mould, it is a series of walls subdividing a large space. The model I was going to make is quite hard to cast – it is thin walls in odd angles, so it’s a definite challenge. I started by using the unroll command on the 3D-model in Rhino and laser cut the resulting pieces. When I started building the mould I realized it would have been impossible to make this thing water tight and so this technique is not only convenient but also may be crucial to the success of this cast. When I demoulded my cast parts of it started breaking apart in one place. As my group looked back on our design, we decided to redesign the part that broke off to make it less fragile. The largest part of the model still held together better than expected since I knew the walls where almost too thin. The walls became a little wobbly, this is because of deformation that has occurred as the mould was being filled. It would probably be better to use a little sturdier paper, maybe even a 1 mm cardboard instead for this kind of mould. After 5 mins we started to tilt the surface. After about 20 mins we started to tilt the board a lot more and the concrete was now sticking to the surface. We wanted to try and emulate lava flow in this assignment. We mixed according to the recipe but thought the concrete was a bit to firm so we added a little extra water. To try and copy this effect we poured the concrete on a horizontal piece of wood and then tilted the surface to try and get the folds right. We soon realized that lava and concrete doesn’t really act the same way. It was hard to get the concrete to fold in the way we wanted but we did two test and one was more successful in emulating the lava, the other one was interesting because we could see a different effect with the cracked surface and the compressed part that broke of and was folded against the table. 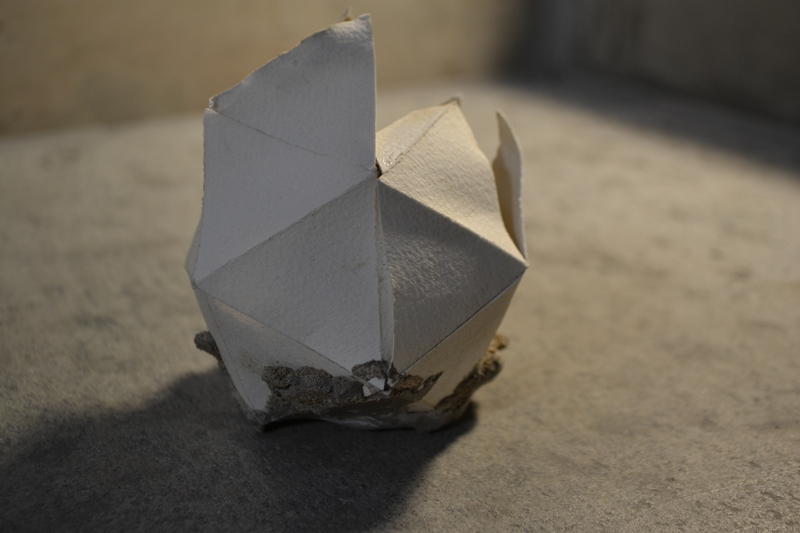 This assignment I wanted to try and make two things, one geometric from with paper and one mould that was made of aluminium foil to see how it reacts with the concrete. Unfortunately, the result wasn’t too great because of a combination of concrete that wasn’t runny enough and aggregate that had too much small sand particles as well as larger stones. But it was still an interesting experiment and I got a interesting result with the concrete going through in the middle making mounds. 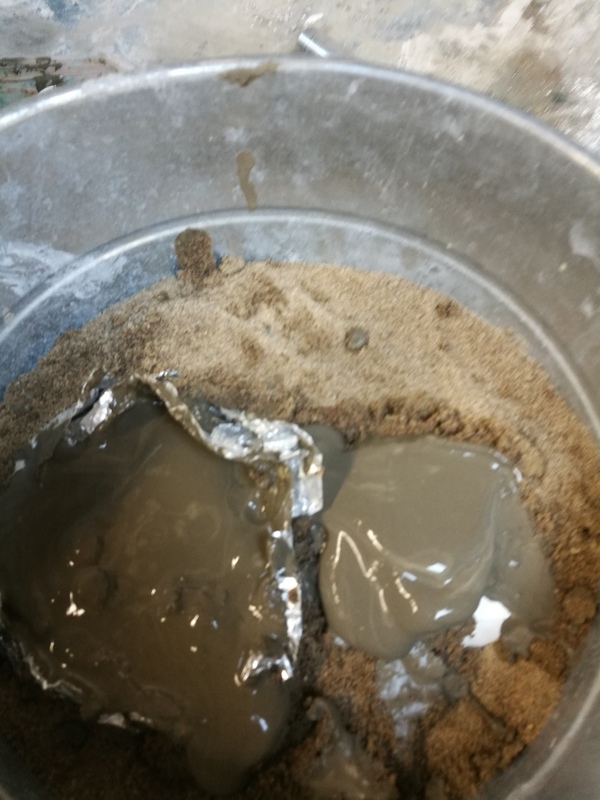 On the side of the test with aluminium foil we can see how the concrete and the foil have reacted. I followed the given recipe and it gave me a good mix to work with fore this assignment – even though it was more like clay than any other consistency and could not have been poured into anything it worked well for what I was doing. The mould was created by a thread that was not very stretchy and a pantyhose with a lot of stretch. I wanted to see the effects this would have so I also made some larger holes in the net structure to see how this would affect the results. This resulted in a cast that was puckering and we can see both the small and the larger holes. The biggest problem was the pantyhose which stuck to the cast and would not come off but that luckily is thin enough for the cast to not be heavily affected by its presence. We tried to take pictures to capture the density of our different mixtures. There is also information about how much we used above. 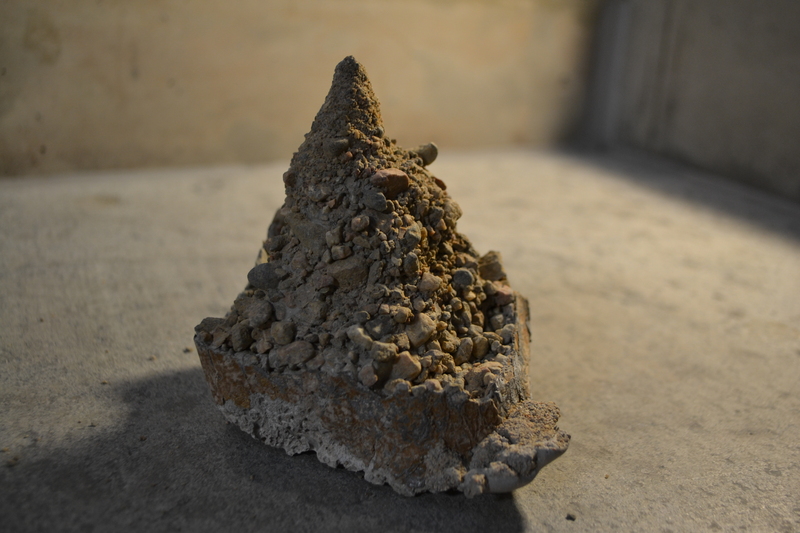 Process: Tshinkel has poured plaster into an ant colony and let is set – then he has excavated the surroundings. This is interesting because it is made by another animal then humans, but is still a made and inhabited space. The cast is fascinating, showing what is under the surface. 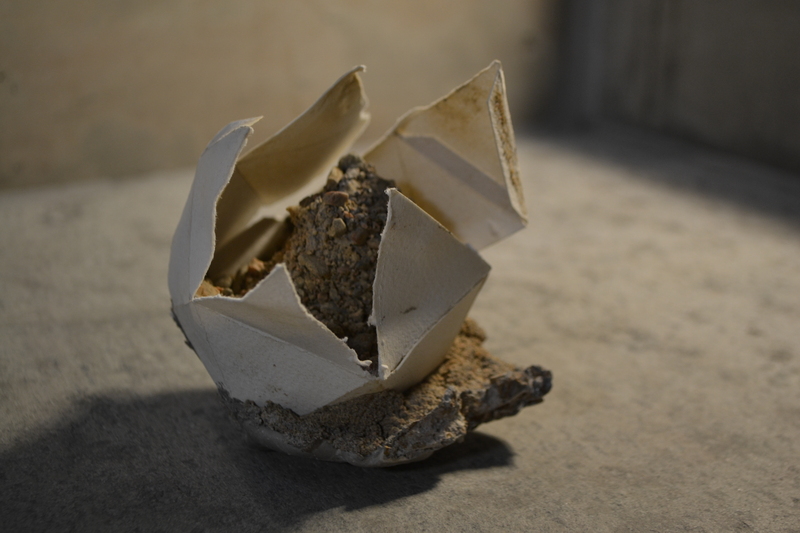 It is also an interesting form, brittle and almost floating. Process: Tufa is a type of limestone that is formed when calcium-rich spring water mixes with the carbonate-rich Mono Lake water and precipitates around the spring. The towers grow underneath the waters surface. Sand Tufa is formed in more sandy regions of the lake near the shore. When the lake level dropped these tufa were exposed to the elements, the wind blew away the remaining sand, leaving these unique formations behind. This is interesting because it has been under the water and can only be seen now because of environmental changes. The shapes are very interesting and complex.